There are also weight, size, and cost advantages to a DX zoom, compared to their larger full-frame counterparts, as the DX lens only needs to produce an image circle big enough to cover the smaller APS-C sensor. FX-format zooms remain compatible with the D500, however, and for a full roundup of the best-performing FX zoom lenses, you can refer to our D5 Zoom Lenses review. 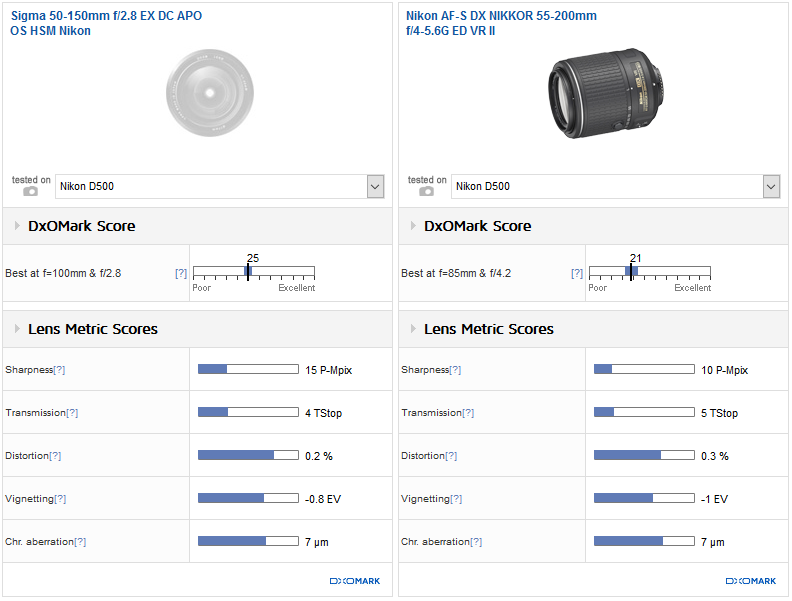 The scores won’t be exactly the same on the D500 (see the section on How FX Lenses Perform on APS-C in Part 1 for more details), but the D5 review will give you the information you need about the best-performing FX-format zoom lenses available for Nikon DSLRs. Just remember the 1.5x crop factor when shooting with a Nikon APS-C, as the smaller sensor extends the lenses’ stated focal length (referred to as the lens equivalent focal length in 35mm terms). We will, of course, reference some of the best FX zoom lens choices for the D500 in this review, but our focus remains on the DX zooms. 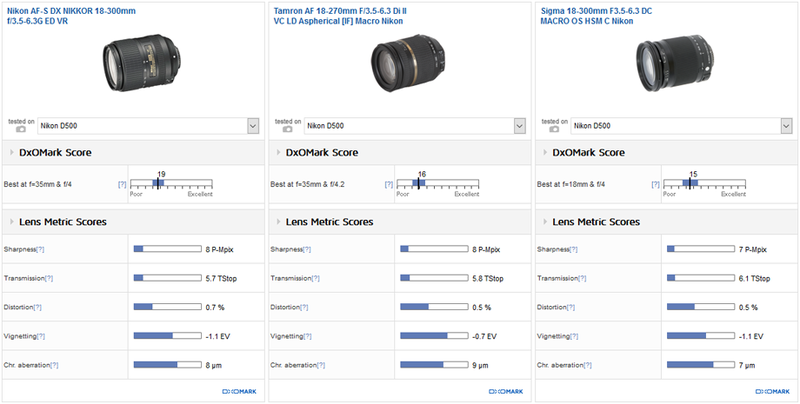 We’ve tested a total of 47 DX-format zooms on the D500, with scores ranging from a high of 30 points on the Sigma 18-35mm f/1.8 DC A to a low of 13 points on the Tamron 18-270mm f/3.5-6.3 Di II VC. We analyze the highlights, drawbacks, and image quality of the some of the best performers across four categories, including wide-angle, standard, telephoto, and super-zoom. An ideal lens for landscape and architectural photography, as well as for shooting in restricted spaces or creating some dramatic effects, a wide-angle zoom is a great addition to your lens arsenal. Wide-angle Nikon DX zooms include an 8mm fisheye lens, which produces enormous barrel distortion for unusual images, and a 10mm rectilinear lens that keeps lines much straighter. A 10mm DX focal length equates to an equivalent 15mm when you take into account the 1.5x crop factor on Nikon APS-C, making it an ultra wide-angle focal length. We’ve tested 13 wide-angle zooms with focal lengths up to 35mm on the D500 with scores ranging from a high of 30 points on Sigma 18-35mm f/1.8 DC A to a low of 13 points on the Sigma 10-20mm f/4-5.6 EX DC. We’ve listed the top 10 in the table below. The top-performing $799 Sigma 18-35mm f/1.8 DC A offers a slightly longer focal length, equivalent to 27- 52mm, and while that’s still a wide-angle on the D500, it’s perhaps not the best option for landscape or architecture shots when you want a really wide field of view. The Sigma’s f/1.8 maximum aperture, combined with the slightly longer focal range, makes it a good option for press and event work in low light, however, and it’s one of the sharpest APS-C lenses we’ve tested for the D500. 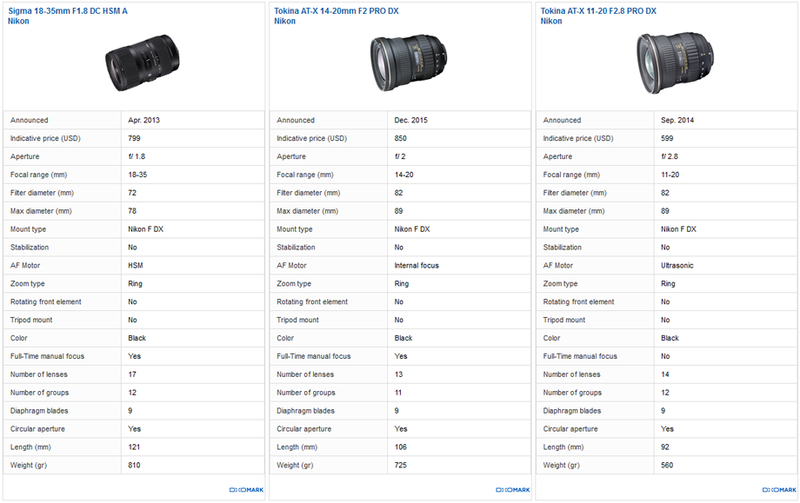 Tokina also offers two wide-angle zooms among the top three, including the $799 Tokina 14-20mm f/2 PRO DX and the even wider $499 Tokina 11-16mm f/2.8 PRO DX (equivalent 16-24mm). Both feature fast maximum apertures and a minimum f/22 aperture for longer depth-of-field shots; and the more expensive f/2 version boasts very good sharpness, as well as improved transmission and handling of chromatic aberration compared to the Tokina f/2.8 version. 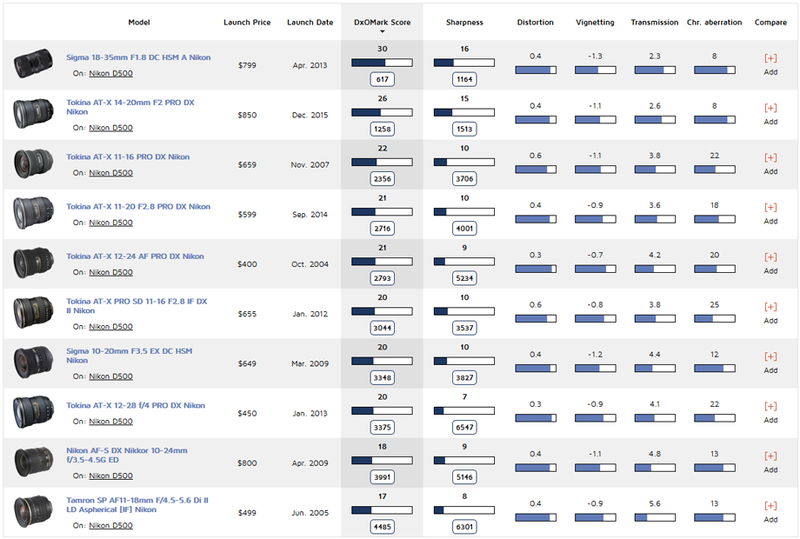 The Sigma 18-35mm f/1.8 DC A wins overall with the best scores for sharpness and transmission, but the Tokina 14-20mm f/2 PRO DX is not far behind if you’re after a wider focal length. The Sigma offers excellent center frame sharpness at all focal lengths up to f/11, just marginally ahead of the Tokina 14-20mm, which is also very good in the center up to f/11. The Sigma offers slightly more consistent edge sharpness across the focal lengths and aperture settings compared to the Tokina 14-20mm, but both offer good edge sharpness up to f/11. The Tokina 11-16mm displays softer edges between 14 to 16mm using apertures from f/2.8 to f/5.6, and at all focal lengths between f/16 and f/22. Some noticeable chromatic aberration is evident on the Tokina 11-16mm at the wider focal lengths using all aperture settings. The Sigma also offers slightly better vignetting compared to the wider-angle Tokina lenses at the maximum apertures. None of the FX wide-angle lenses we tested had better scores on the D500 than the DX options. Sigma’s range of top-end Art, or A, lenses offer high-quality results at very competitive prices. The Sigma 18-35mm f/1.8 DC A is one of the sharpest zoom lenses we’ve tested on the D500 and an all-round top performer, but has a limited wide focal length with no ultra-wide field of view nor an f/22 minimum aperture if you’re primarily interested in a landscape lens. For the same $799 cost as the Sigma, Tokina’s 14-20mm f/2 PRO DX gets you a bit wider field of view, and offers very good overall image quality as well as an f/2 maximum and an f/22 minimum aperture setting. It’s not quite as consistent as the Sigma across the various focal lengths and aperture settings, but it’s still very good. The $499 Tokina 11-16mm f/2.8 PRO DX is a good value option, featuring an ultra-wide field of view, a fast f/2.8 maximum aperture, and an f/22 minimum. Overall image quality is a step down from the top two performers, with lower edge sharpness and noticeable chromatic aberration at some settings, but it’s still a top-ranked DX wide-angle zoom for the Nikon D500. The typical DX standard zoom covers a 17-50mm focal length (equivalent 26-75mm), offering a versatile wide-angle to short-telephoto focal length in a single lens. This makes it a super-convenient choice for a range of photographic types such as press, events, weddings, portraits, and general use. The top performers in this category are the fixed f/2.8 maximum-aperture options, which offer better light transmission for low-light shooting and are a good option for shallow depth-of-field portraits at 50mm f/2.8. 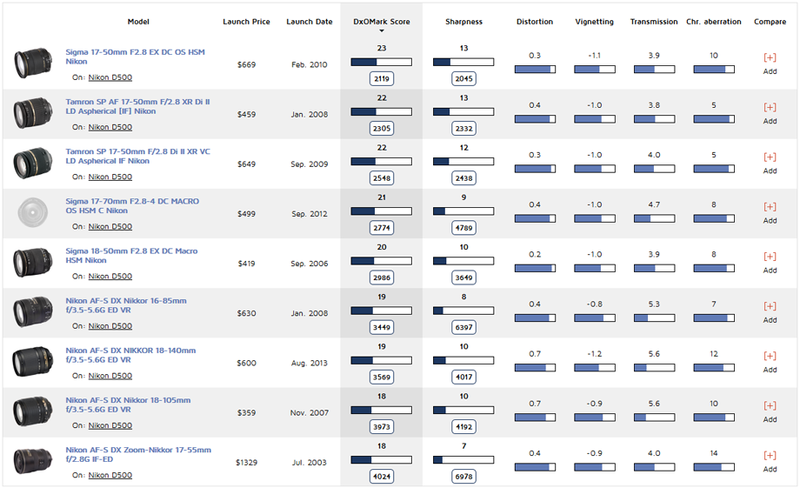 There are also some cheaper variable-aperture alternatives, however, such as the Nikon 16-85mm f/3.5-5.6G ED VR (equivalent 24-127mm) or even the Nikon 18-140mm f/3.5-5.6G ED VR (equivalent 27-210mm), both of which offer a bigger focal range but have variable maximum apertures. Be sure to look for features such as image stabilization, denoted by VR on Nikon, by VC on Tamron, and by OS on Sigma following the lens name. 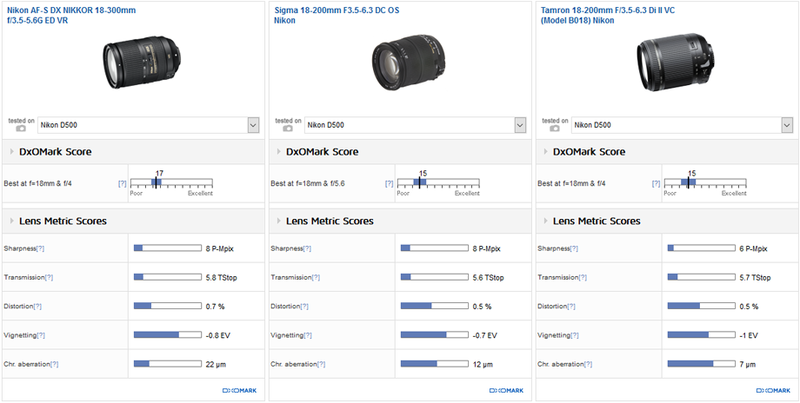 We’ve tested 15 standard DX zooms with scores ranging from a high 23 points on the Sigma 17-50mm f/2.8 EX DC to a low of 15 points on the Sigma 18-125mm f/3.8-5.6. We’ve listed the top 10 in the table below. The top-ranked Sigma and Tamron options offer a very similar proposition, each with a 26-75mm equivalent focal length, image stabilization, and f/2.8 maximum aperture. Both boast excellent scores on the D500, and with the Sigma currently available at a discounted price of $399, it looks like good value compared to $649 for the Tamron. We’ve excluded the now-discontinued Tamron 17-50mm f/2.8 Mark I (in third place in our analysis) and included instead the fourth-place $499 Sigma 17-70mm f/2.8-4 DC OS. With an equivalent 26-105mm focal length, it offers greater reach and image stabilization, but has a variable f/2.8 to f/4 maximum aperture. The Sigma 17-50mm beats the Tamron 17-50mm overall thanks to its slightly improved edge sharpness and transmission, but the scores are very close. Both display some edge softness at f/2.8, but the Sigma is more consistently sharp, with notably better resolution than the Tamron between 35-50mm at f/2.8, which is an important setting on this lens of this type. 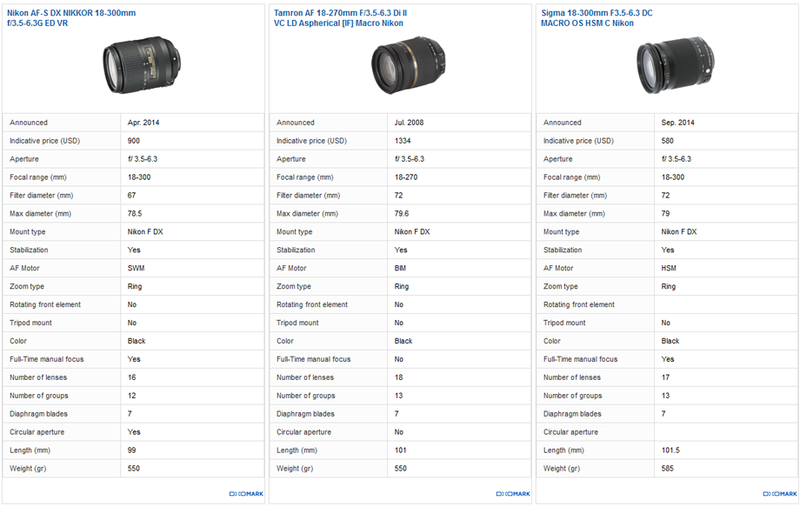 The Sigma 17-50mm hits peak sharpness between f/4 to f/8, and is again a little more consistent across the various focal lengths at these apertures compared to the Tamron. The Tamron 17-50mm f/2.8 controls chromatic aberration better, however; there is more outer field fringing evident on the Sigma 17-50mm, particularly at the longer end of the zoom. Lower sharpness and transmission scores rank the Sigma 17-70mm f/2.8-4 DC OS below the 17-50mm options, but the lens still offers good center sharpness around 70% P-Mpix at the wider focal lengths up to 50mm using mid-aperture settings. Expect softer results at 70mm on the Sigma 17-70mm, however, as well as edge softness at the wider focal lengths. 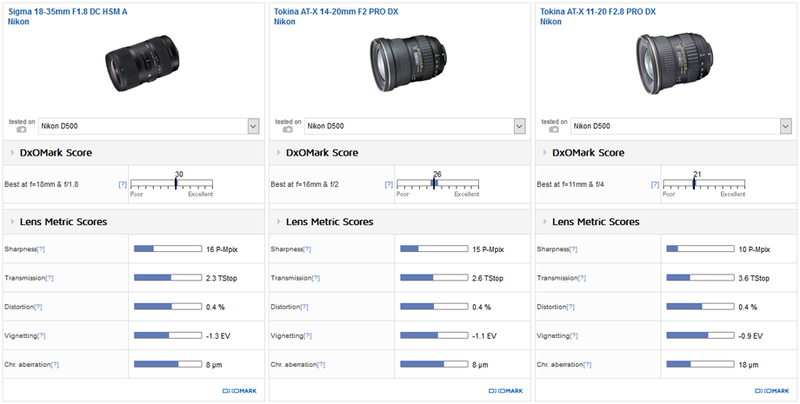 The FX-format Tokina 24-70mm f/2.8 and Sigma 24-35mm f/2 offer marginally better overall sharpness compared to the leading DX Sigma 17-50mm f/2.8 EX DC standard zoom, with higher levels of resolution at some settings. The DX Sigma isn’t far behind, however, and taking into account the less-versatile equivalent 36-105mm focal length on the Tamron, and the 36-52mm of the Sigma — not to mention their higher price tags — they’re not quite as attractive as the Sigma 17-50mm f/2.8 for use on the D500. Alternative DX options include the $497 Nikon 18-140mm f/3.5-5.6G and the $397 Nikon 18-105mm f/3.5-5.6G, which boast a more versatile focal range with longer reach. 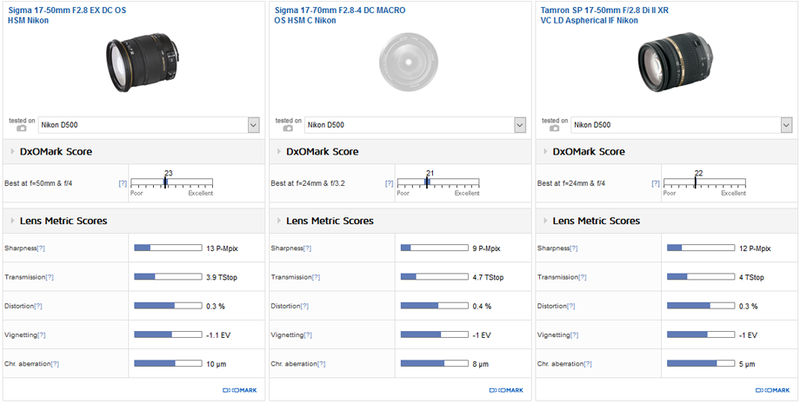 Their sharpness and transmission scores are down compared to the class-leading Sigma and Tamron options, however, with reduced peak sharpness and more inconsistent edge resolution. That said, these longer standard zooms are capable of good center sharpness at all focal lengths using apertures up to f/11. If you don’t want to carry around a bunch of lenses, a standard zoom is a great all-in-one workhorse lens for shooting a variety of subjects. 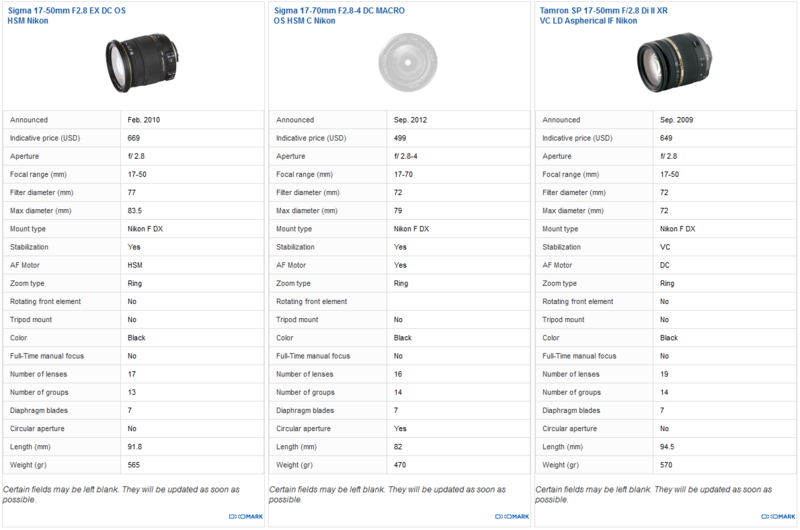 Featuring a fixed f/2.8 maximum aperture and image stabilization, both the top-performing Sigma and Tamron 17-50mm DX versions are good options with similar scores. The Sigma 17-50mm just edges the Tamron with slightly more consistent sharpness across the various settings, and currently available at a discounted $399 from B&H, it’s great value. Spending more cash on FX options, such as the $1080 Tokina 24-70mm, doesn’t get you significantly better image quality on the D500, with the exception of slightly improved edge sharpness — but this comes with a less versatile equivalent 35-105mm focal range and no image stabilization. The typical DX telephoto zoom with a 55-200mm focal length (equivalent 82-300mm) provides plenty of reach for Nikon D500 shooters looking to get closer to the action with sports, wildlife, or general long-lens shots. The more affordable, mass market-oriented options commonly feature variable f/4–5.6 maximum apertures, which reduce light transmission at the long end of the zoom. This can affect autofocus performance as well as make it difficult to achieve the fast shutter speeds required for action photography. Image stabilization (VR Nikon & OS Sigma) can help in some situations, allowing you to shoot relatively static subjects using slower shutter speeds. You’re going to need pretty good light to achieve the shutter speeds required for sharp action pictures at the long end of the focal range with a variable-aperture DX telephoto zoom. 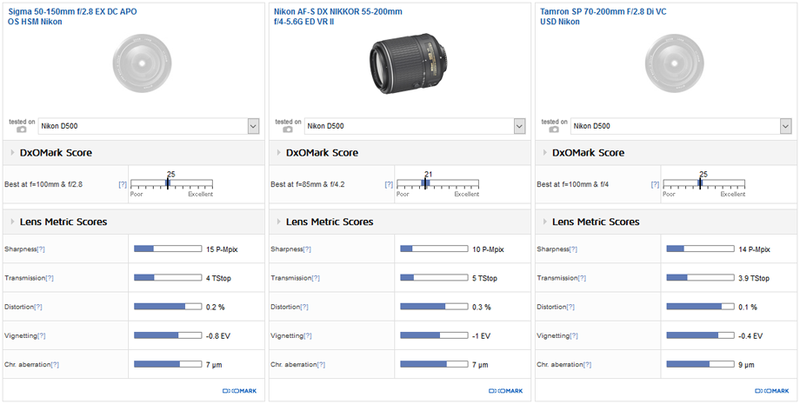 We’ve tested five DX telephoto zooms with scores ranging from a high of 25 points on the Sigma 50-150mm f/2.8 to a low of 15 points on the Nikon 55-200mm f/4-5.6G. The Sigma 50-150mm f/2.8 is an interesting choice for D500 shooters, offering an equivalent 82-225mm focal length that’s more in line with the typical full-frame 70-200mm telephoto zoom range that many pros opt for. Its fixed f/2.8 maximum aperture lets in around 4 times more light compared to the 55-300mm f/4-5.6 alternatives at the long end of the zoom, so is much better for fast shutter speeds, and it benefits from image stabilization, too. Unfortunately, this lens has been discontinued, perhaps because Sigma is focusing on its new 50-100mm f/1.8 DC (that we’ve yet to test), but if you can find a new one on the market or a second-hand model in good condition, it’d make a great second lens to add to the Sigma 17-50mm f/2.8 EX DC on the D500. The Sigma offers notably better overall resolution compared to the cheaper Nikon 55-200mm alternative, with good sharpness at all focal lengths at apertures up to f/8. Using the maximum f/2.8 aperture, the Sigma boasts good center sharpness between 50 to 70mm, and excellent uniform resolution at 100mm f/2.8, although slightly softer at 150mm. Despite a lower overall sharpness score compared to the Sigma, the Nikon 55-200mm remains very good for a lens of this grade. 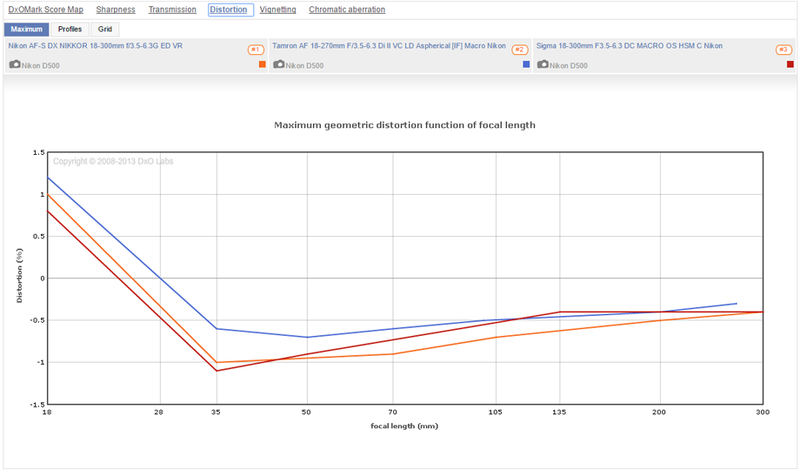 It displays good center sharpness between 65-70% P-Mpix at most focal lengths using apertures up to f/11, and although edge resolution is a little weaker, particularly at the widest and smallest apertures, more uniform results are possible at the middle apertures. The Sigma 50-150mm offers better light transmission at a consistent 4 TStop through its focal range — one stop less light than its maximum aperture. By contrast, the Nikon 55-200mm ranges between 4.4 to 4.8 TStop up to 135mm, but then light transmission reduces markedly (down to 6.9 TStop) between 135 – 200mm, so expect a darker viewfinder and slower autofocus performance at the long end of the zoom. Both lenses vignette a little at their respective widest aperture settings, with the Nikon 55-200mm slightly worse (though closing down a stop all but eliminates the problem). There’s some fringing evident with both lenses at some settings, too, but as it’s restricted to the far corners, it’s not overly problematic. For a fixed f/2.8 aperture telephoto zoom, the FX-format Tamron SP 70-200mm f/2.8 Di VC provides similar overall image quality and sharpness to the Sigma 50-150mm. Priced at $1499, it is currently available with a $300 mail-in rebate from B&H through December 3, 2016. The Sigma is slightly more consistent in the corners on the D500, but the longer 105-300mm equivalent focal length of the Tamron at f/2.8 makes it an attractive option for sports and wildlife photography. 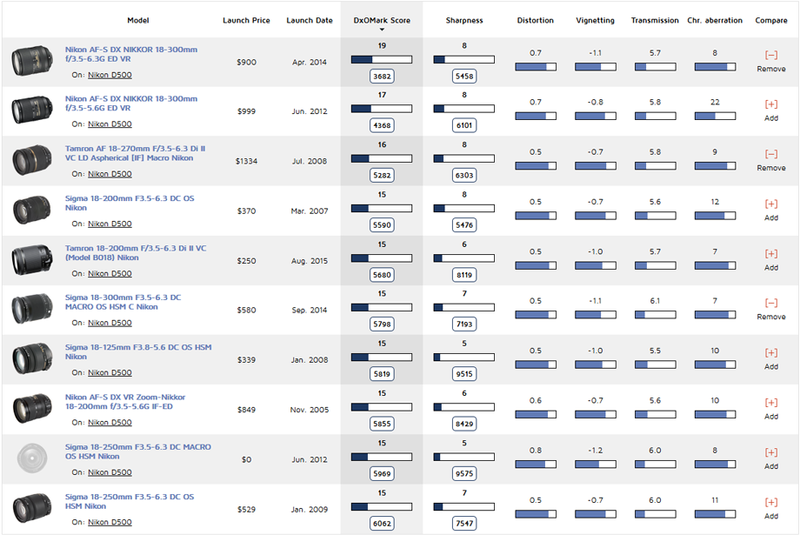 Sure, it’s not cheap, but when you consider that an equivalent 300mm f/2.8 lens for full-frame DSLRs costs over $3000 for a Sigma 120-300mm f/2.8, or over $5000 for a Nikon 300mm f/2.8 prime, the APS-C crop factor has some advantages and the Tamron 70-200mm f/2.8 Di VC looks like a good value in comparison. The 55-200mm f/4-5.6 telephoto zoom is a popular second lens choice for APS-C shooters after more reach. Currently available for just $147 at B&H, the Nikon 55-200mm f/4-5.6 is an amazing value and offers good performance with respectable levels of sharpness at many settings, particularly in the center of the frame. Of course the variable aperture means it’s best used in good light, but the inclusion of image stabilization will help in some low light situations. The DX-format Sigma 50-150mm is a step up in image quality, producing sharper results particularly in the corners, and it boasts a fast fixed f/2.8 aperture for better light transmission and shallow depth-of-field shots. Unfortunately, this lens has been discontinued, so you might struggle to find one new. A good alternative is the FX-format Tamron 70-200mm f/2.8 Di VC ($1199, discounted from $1499), which offers similar features and levels of sharpness on the D500, if you can cope with its longer 105-300mm focal length. A popular all-in-one lens for APS-C shooters, a DX super-zoom typically offers focal lengths between 18-200mm or 18-300mm, which provide an equivalent 27mm wide-angle through to 300mm or 450mm super-telephoto focal length that covers all bases. Once again, these more affordable and lighter lens choices feature “slow” variable maximum apertures that often stop down to either f/5.6 or sometimes to f/6.3 at 300mm, so lower light transmission at the long end of the zoom means you need some pretty good light for decent autofocus performance and quality images at 200 or 300mm. Image stabilization is useful for achieving blur-free shots of relatively static subjects at shutter speeds as slow as 1/60. 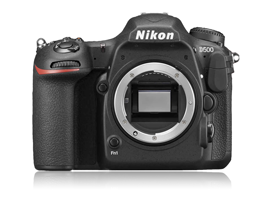 A range of both Nikon own-brand and third-party options are available in this category, and all offer similar propositions in terms of size, weight, features, and image quality. We’ve tested 14 super-zooms on the D500 with scores ranging from a high of 19 points for the Nikon 18-300mm f/3.5-6.3G ED VR to a low of 13 points on the Tamron 18-270mm f/3.5-6.3 Di II VC. We’ve listed the top 10 in the table below. The top three super-zooms on the D500 all produce their sharpest and most uniform resolution at the wider focal lengths up to 50mm; they can achieve good center sharpness around 65-70% P-Mpix using apertures up to f/8. Compared to the third-party competition, the Nikon 18-300mm boasts slightly improved center sharpness at the maximum f/6.3 aperture as you zoom in between 100-300mm. You can achieve some relatively uniform sharpness by using the wider focal lengths at some apertures, too, but fully zoomed in, expect lower levels of resolution and edge softness on all three lenses. Edge softness is particularly evident on the Tamron, dropping to around 40% acutance at the edges using 270mm and f/6.3. Some corner shading occurs on both the Nikon and Sigma super-zooms at the wider focal lengths using the maximum apertures, but it’s not a huge concern. Perhaps more of an issue is noticeable chromatic aberration towards the longer end of the focal range on the Tamron and the Nikon, which affects the Nikon more between 135-300mm in the outer field at the maximum aperture. By contrast, the Sigma 18-300mm handles fringing much better. Distortion can also be an issue on super-zoom lenses, and the Sigma has noticeable barrelling at 18mm and pincushion at 35mm. Pincushion distortion gets better between 35-300mm, but remains over –0.5% on all lenses up to 105mm. So while the wider focal lengths generally provide the sharpest results on these super-zooms, there will be some noticeable distortion unless you correct in post-production. There are no alternative FX lens options that provide the same or a similar wide-angle to super-telephoto on the D500, but there are a couple of alternative DX solutions. Nikon has a very similar 18-300mm f/3.5-5.6G lens, which offers one-third of a stop wider f/5.6 maximum aperture at 300mm. Costing $997, it’s an extra $300 compared to the f/3.5-6.3 version, but doesn’t offer significantly better image quality and is notably heavier at 800g. 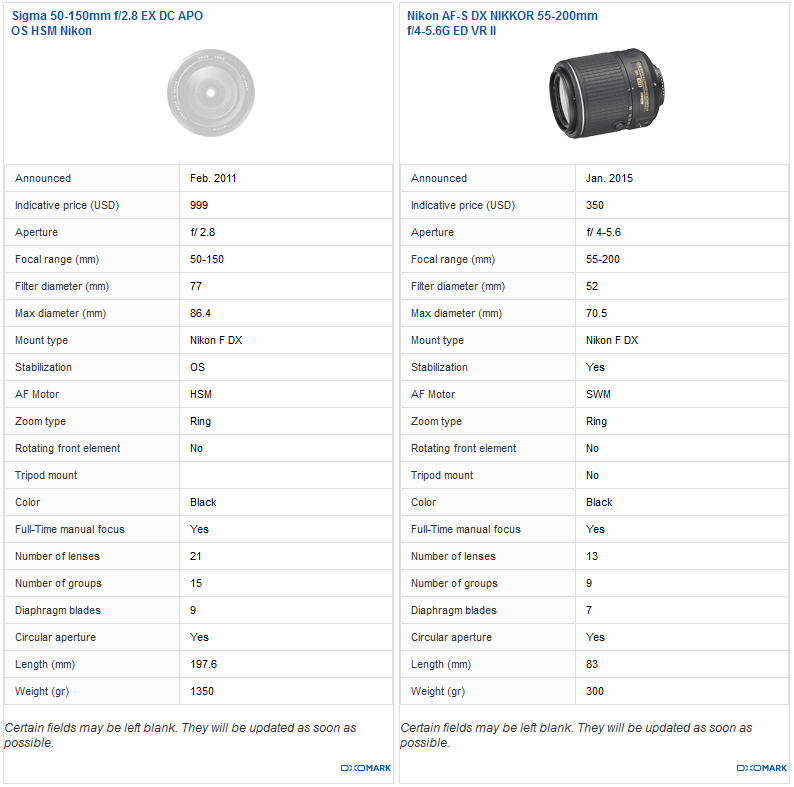 There are a couple of shorter focal length and even cheaper options from Sigma and Tamron, however, such as the $399 Sigma 18-200mm f/3.5-6.3 and the $199 Tamron 18-200mm f/3.5-6.3. 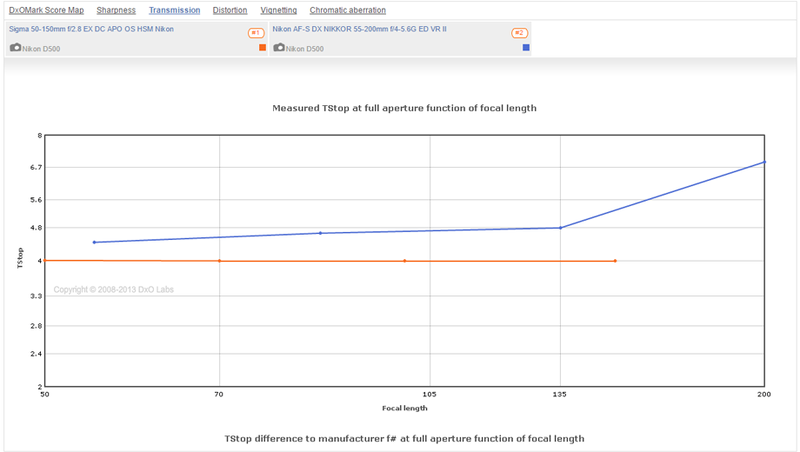 But both display lower overall scores compared to the 18-300mm versions, so the short focal length doesn’t really improve image quality; further, the Tamron 18-200mm actually has a lower overall sharpness score, so its only advantages are the cheaper price and slightly reduced weight.